In large bowl, mix sweet potatoes and 3 tablespoons onions. In small bowl, mix flour, salt, black pepper, cinnamon and red pepper. Add flour mixture to sweet potato mixture, stirring until blended. Add egg, stirring until blended. In 12-inch skillet, heat oil over medium heat 2 to 3 minutes or until hot. Drop batter by heaping tablespoonfuls into hot oil, flattening to form 3-inch pancakes. Fry 4 to 6 minutes, turning once, until golden brown and edges are bubbly. Drain on paper towels. 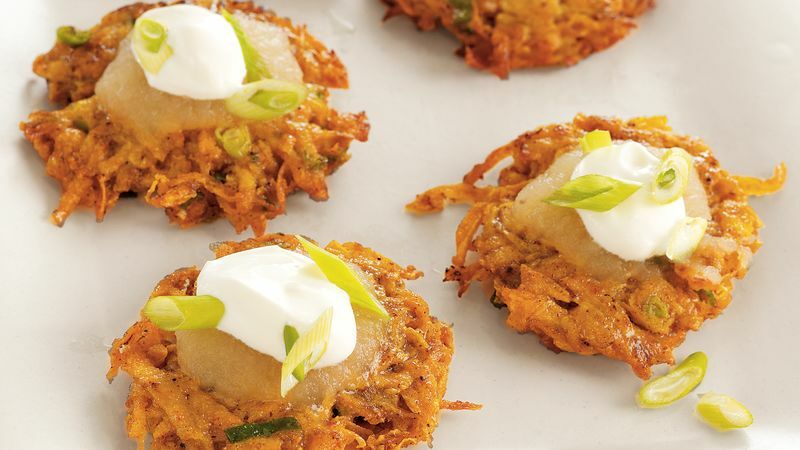 Top with applesauce and sour cream; sprinkle with remaining tablespoon onions. Serve hot.